We are introducing two new features during the Test Server of Operation Para Bellum. We are improving the user interface (UI) of the observation tool system and adding a secondary gadget for Defenders, the Bulletproof Camera. Right now, players need to perform many actions to reach the drone or camera that they want to see through – especially if they want to switch between two active observation tools (i.e. if Twitch wants to swap between piloting her first and second drone). Our main goal is to simplify this flow, provide a better user experience and a cleaner UI. This image is an early screenshot of the new UI that we will be implementing. As you can see in the bottom left corner, we replaced the black dots representing the observation tools with actual icons of the tools that you have available. One of the main benefits of this change is the possibility of observing through your teammates drones during preparation phase while preserving your drone. It will also be much easier to scroll through the list of available cameras and/or drones. Furthermore, this will allow our team more freedom to implement operators with complex intelligence gathering tool kits in the future. The observation tool changes come right in time for the new addition to the Defenders intel-gathering arsenal: the Bulletproof Camera. The Bulletproof Camera is a secondary gadget that will be given to six Defenders. This new device will allow them to have more options to hold an objective and counter some attack strategies. The Bulletproof Camera is unbreakable from the front, but can be shot and destroyed from the sides. Thatcher’s EMP grenades and Twitch’s Shock Drone can counter it. It can scan enemies and see through smoke. It cannot be thrown and needs to be deployed, similarly to Jäger’s Magpie. Frost – Bulletproof Camera instead of Deployable Shield. Doc – Bulletproof Camera instead of Deployable Shield. Mute – Bulletproof Camera instead of Deployable Shield. Castle – Bulletproof Camera instead of Deployable Shield. 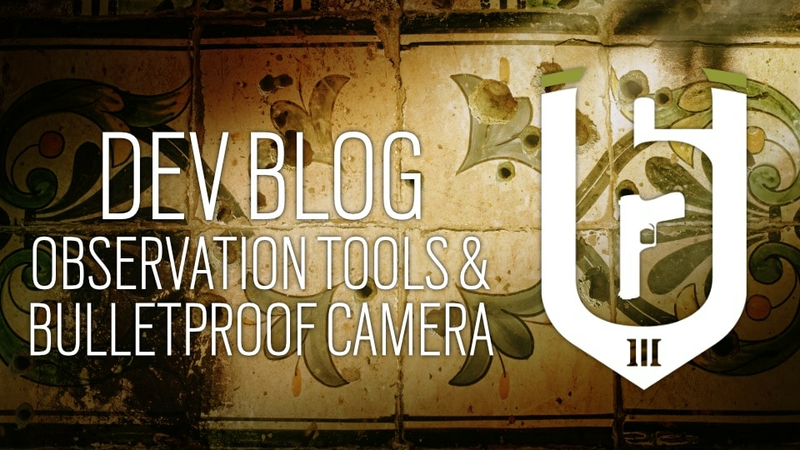 Caveira – Bulletproof Camera instead of Barbed Wire. Vigil – Bulletproof Camera instead of Barbed Wire. We expect the Bulletproof Camera to provide an alternate intelligence gathering tool for the Defenders, and to allow them to have more variety with Operators picks. It may also act as a counter against strategies like the smoke grenade/plant meta. After the introduction of the Bulletproof Camera, Attackers might have to think twice before rushing the objective and planting the defuser, as they will need to decide whether to move to counter the Bulletproof Camera or accept the risk and plant. We are interested in hearing your thoughts, and gathering your feedback! Please jump into the discussion on the subreddit and forums and let us know what you think.